Join the discussion on our forums! Come discuss Wargear over in our dedicated Wargear discussion topic. WAR! GEAR! What is it good for? The flavor text is a reference to the anti-Vietnam protest song "War"; most famous version sung by Edwin Starr. "War. What is it good for? Absolutely nothing." Gamers might recognize it from the Battlefield: Vietnam soundtrack. slightly worse version of kings for mechs but has flexibility to be played as a 5/5. Meh... King's is borderline playable card and I don't see this faring better, my guess is borderline unplayable card. Isnt this total op in Warlock with glinda and mechwarper? 9 mana infinite stats??? War Gear is going to be hitting people really hard in the face in both standard and wild. 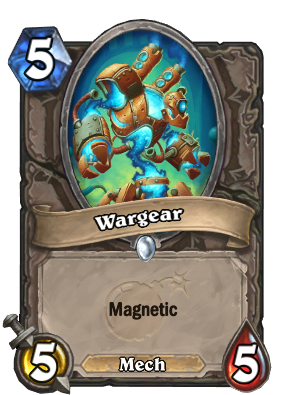 With all the mech synergies, especially mech mage are going to enjoy this card a lot. I can see this being played, ok 5 mana 5/5 isn't great but, Blessing of Kings sees play. Attach it to nearly any mech for a pseudo-kings. It's a three-card combo, so it will never see regular use, but I do want to screw around with getting a mech to stick for a Shaman deck where I then play this on top of it and hit it with a Windfury or a turn nine Windspeaker. Viable for competitive play? No. Viable for fun play? Hell yeah. Pretty good stats but Cobalt Scalebane is a little bit better. Nevermind, either one will be silenced.